We are concerned about the British media silence regarding the recent attack on a refugee camp in Patras Greece as a reflection of the idea of Fortress Europe. As trade unionists and academics who research issues of human rights and social inequality we strongly condemn the recent use of violence against migrants in Patras, Greece. Greece has been repeatedly condemned by international organisations over maltreatment of migrants and asylum seekers. In recent weeks we have witnessed further demonisation and victimisation of migrants and asylum seekers. Punitive police operations are presented as the answer and the authorities fuel the media with xenophobic rhetoric and images. As a result there is a dramatic increase in cases of brutality against migrants. The authorities not only seem to tolerate attacks of fascist groups on individuals and families, but also orchestrated a brutal and unlawful operation against the refugee camp in Patras. Thousands of migrants have been living in this makeshift camp for over the last eight years without any support and protection from the Greek state. The Greek authorities made it impossible for most of them even to apply for asylum, by not providing access to the necessary services. During this period the migrants were systematically harassed by the police and coast guard and were labeled as “clandestines”. Nevertheless, nothing could prepare the local community of Parts and the groups of citizens who voluntarily support the migrants, for what was about to happen last week. In the early hours of Sunday 12/7/2009 and without any previous warning, hundreds of fully armed riot police engaged in an inhuman and appalling operation. As the UNHCR, International Human Rights Organsations and local support groups highlight, major streets were blocked and access to the area was banned. The state authorities, arrested hundreds of migrants, demolished and burned down the makeshift accommodation, including personal belongings, travel documents and the camp mosque. The migrants who had travel documents were temporarily directed to a local hotel. The rest of them were arrested and there seems to be no further information concerning their whereabouts. It is highly likely that a number of unaccompanied minors were among the group, as the decision on who was minor solely lied upon the “judgment” of riot police during this inhuman operation. We also express our concern about the possibility of forcible repatriation of the migrants to Afghanistan. For the lucky ones who escaped arrest things are not any better. Without any facilities to offer protection and support, hundreds of migrants live dispersed and terrorized in the city centre without being able to meet their very basic human needs. The operation lacked any legal, ethical and moral basis. Who decided it? Why did the operation take place without any previous warning and most importantly without ensuring that access to other reception facilities would be available? How many migrants were arrested and where exactly are they being detained? How did they ensure that unaccompanied minors were not maltreated and abused? Why migrants were not offered an opportunity to apply for asylum? Are there plans to forcibly repatriate them without any prior access to the asylum process? Will Greece keep tolerating the racist and xenophobic attacks against migrants and their families? In the absence of an official answer we reserve our right to visit the area and make use of any means at our disposal to ensure that the authorities and individuals involved will be held accountable of their actions. Mrs. Julia Orry, Blackpool Branch Secretary (personal capacity). A demo took place yesterday in Patras called by Antiauthoritarian Movement, ΝΑΡ, νΚΑ & ΕΕΚ against the under construction refugee concentration camp at the area MOMA at Patras and the demolition of the Patras port refugee camp (this means that the police today attacked both Afghans at the Port refugee camp and Roma people at the new camp construction site area, source: patras indymedia). Here is the call for the demo in Greek. A report from the demo said it was a succesfull one and lasted almost 4 hours covering a long distance in Patras. Despite the constant attacks by the police, the tightening of surveillance and the pressures by various sides which have made many immigrants reluctant to fight against this development, many immigrants joined the demo. Below is a text in English from Patras indymedia about the demo and the developments there, source: here. 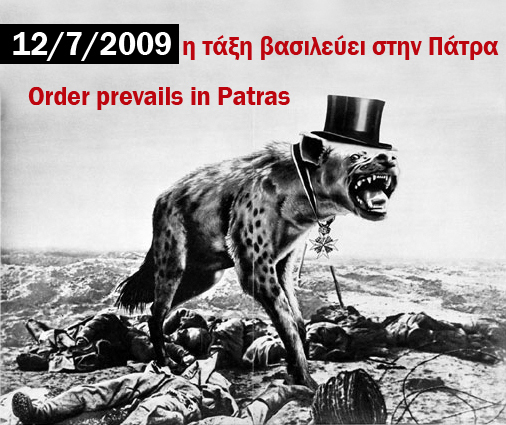 Until the end of this month, the government has announced new decisions for Patra and Immigrants. After pressure from local authorities, media, racist people, police and port police, the government decided to clear the city from immigrants, from you, in order to satisfy all the previous. So, for the next days and until the end of this month the police forces are planning arrests of migrants/refugees without papers and to transfer them in a army-camp, about 6-8 kilometers out of Patra. This camp will be closed with fences, controlled by the police, meaning that the immigrants will be like prisoners, until the time to deport them. At the same period, the places/camps where Afghans, Somalians, Arabs and other immigrants live now, will be destroyed. The authorities promise that in the new camp they will provide food, water and cleanness. But what’s the worth of that, neither papers and job nor freedom they give to immigrants. And referring to the conditions inside the new prison camp, it is just lies. As we can see from other detention centers in Greece, after some weeks the arrests are increased, the prisoners inside the camp are increased, with final result the immigrants to be piled on each other, like animals. Also, the police and the port police will be increased, in order to make more arrests and locate the immigrants that go inside the port and the tracks. It is obvious that all these decisions are against you. They just want to make you disappear, because for all these people you are just a problem in their feet. Not only in Greece, but also in every country in Europe. Most countries have started the same effort to get rid of the immigrants, by jailing and deporting them , by denying to offer them any type of help. All countries, and Italy and France and England and Germany…..ALL! So, the war for you is everywhere, not only in your homeland. Because of all these things, we must finally react, fight, if we want to hope for a better tomorrow for us and for our children. To react all together, Afghans, Somalians, Palestinians, Iranians, Moroccans, Algerians, Tunisians, Iraqis, Africans, Greeks, all. Not each one alone, no more fighting between immigrants. All together we stand, we are many, we have common needs, we are equal. We react all together, because if we not, then we are all going to lose. This is what we propose for the next days: We propose to have a meeting all together, to discuss and to take decisions on how we will react to the future that they prepare for immigrants without asking them. We have nothing to lose, neither you nor we. Who are we that we say these things and what we have done in the past. We are students, workers, unemployed, common people that we have papers, but our freedom is half freedom, when the people next to us are like prisoners, without freedom, like immigrants are. As you don’t have home, job and rights, in the same way our home, jobs and rights are in doubt every day. These people who chase you, put you in prisons, make laws against you, deny you every right in decent and respectful life, these are the same people who put in doubt and attack our rights and needs. So this is a common struggle for our rights, our needs, our lives against those who contestate and steal them. We want equal rights for all, and for you also. The enemy is common, the needs are common, so and the fight must be common. We believe that we are not different from you, that you deserve the same rights (education, work, insurance, medical care). We are against human to human exploitation, we express our solidarity to/with anyone who gets oppressed and resists to this oppression. We do not ask for your votes and we do not aim to take votes by helping you. We are common young people, workers and unemployed, ready to stand side by side with anyone who resists, reacts and fights. We will stand next to you, not behind you, not in front of you. We are equal, we decide all together. Last year we resisted together with the Afghan Camp against its destruction, we provided as much material, medical, educational and legal support as could. We tried through demonstrations, open discussions, concerts to make the voice of the immigrants for dignity and freedom gets heard. This is a Fortress Europe article. Italian version here, Greek version here. For a relevant development see here. Minoan Lines ferry dock, Venice. Eight o clock in the morning, some day in August 2008. Juma K. does not recall the exact date. It was the first time he reached the port after months of failed attempts. He had embarked in the truck trailer three days ago, at night. The truck was parked at the port of Patras. There is enough time to climb on it from the moment the port gates open until the police comes. When they counted themselves, they were 15; 10 out of them were minors. The stocks of water and biscuits lasted for 24 hours. The summer sun made everything more difficult. On the third day, at last, somebody turned on the engine and the truck embarked. Upon arrival in Italy, the trailer disembarked and no one took notice of their presence. It was only in the evening, around 19:00, at the port’s square, when some agents of the security forces opened the doors for inspection. that truck. The police got everyone again on board, and locked them in a bathroom, with a little water and a plate of spaghetti al pomodoro. A few hours later, at midnight, the Minoan Ferry sailed back to Patras again. At the time Juma was 16 years old. Today he lives in Rome. We meet him at the Italian school that is attending, Asinitas. He lives in the Italian capital since the 26th of November, 2008. Thanks to the support of a Greek organization, he could legally join there his older brother, Adel, who lives in Rome for three years, with a residence permit as a political refugee and has an assistant cook job in a restaurant of the city center. He is just one of the thousands Afghan and Iraqi refugees who are repulsed each year from Italian ports back to Greece, on the basis of a readmission agreement signed by both countries in 2001. But in his case there is an even more aggravating circumstance. He is a minor. The United Nations High Commissioner for Refugees, with a note dated 15 April 2008, has asked that readmissions to Greece of all potential refugees are suspended, because Athens is not able to ensure adequate protection for them, especially in the case of minors unaccompanied by family members. By law, them should enjoy an exception status. And not only that. According to the Article 19 of the Legislative Decree 25/2008 on the procedures for recognition of refugee status – which was endorsed by the European Union – it is clear: “The unaccompanied minor who has expressed his/her willingness to seek international protection must be provided with the necessary assistance to aplly for that” . But all this is mere theory. The practice is that of repulsion, of everyone, including minors. Gian Antonio Stella complained about that on the 31st of March with a Corriere della Sera article. But the Interior Minister Roberto Maroni denied the situation, calling the journalist to present”the necessary evidence”. We did this for him. And we discovered that the repuslion of the Afghan children from Italian ports is a [standard] practice. Juma K. himself was rejected three times; the fourth time he almost suffocated to death. The second time Juma K. embarked alone on a Superfast ferry to Bari. He succeeded to hide himself under the chassis of an English truck, while the other Afghan boys were scattered by the police. The ship reached Puglia at 18:00. The driver noticed him and pulled him out with force, then handed him to the Port Police agents asking him to calm down. Juma K. showed me a scar on hiselbow, inflicted by the clash with iron frame of the truck when the driver snatched him out of his hideout. The only thing that the police asked was if he had paid the driver and how much. They did not pay attention to anything he was saying. He kept repeating the only words in Italian that he had memorised: “My brother Roma.” He also tried his English, which is definitely good, but no agent spoke any. They gave him a small bottle of water. He was soaking in sweat. This time they locked him in a room near the engine. Upon his return to Patras, like the last time, he was locked up in a container placed next to the headquarters of the Greek police in the port and used as a detention facility for refugees found on the ferry to Italy. I had already seen a video on Youtube, filmed inside the container, from an Afghan boy with a his mobile phone cam. Juma, however, adds frightening details. During his detention, seven days, with four other people, he had his wrists handcuffed. He was released only to go to the bathroom, but still handcuffed to another person. From the first of September 2008 to November 30, according to the Ministry of the Interior, 1816 people have been repulsed on the ports of Venice, Ancona, Bari and Brindisi. Most of them towards Greece, most of them Afghans. We do not know how many out of them were children, since many repulsions take place without any notification of the associations working at the ports in agreement with the Prefecture for the protection of the right of asylum. This is confirmed by the Italian Council for Refugees (Cir) itself. In 2008 about 850 people were found on ships in the port of Venice, Cir was informed only about 110. What about the other 740? After his third refoulement – again from the port of Bari, along with five other children hidden in a truck – at the end of August Juma tried for the last time. Together with a same-age Tajik they hid inside a tight compartment below the chassis of the trailer of a truck. When the ship departed, at 18:00, the heat was still intense. A few hours later, the oxygen was running low. The door could not be opened from the inside. They began beating with their fists on the walls. When one of the men on board pulled them out, the two fainted and fell to the ground. One hour more in the truck would be fatal. They would be found dead, as 13 year old Zaher Rezai was last December, under the truck where he was hidden in order to reach Italy. Or the Iraqi boy crushed by the axles of a vehicle, on March 29th, again in the port of Venice, three days after another lifeless body was found on a ship in Ancona. It is not difficult to die trying to demand political asylum in Italy. Not even for a minor. Perhaps this is what the government should provide “the necessary evidence” for. This is a Fortress Europe article – in Italian. See the original post for more in-text URL links. Here is the Greek version. The European Court of Human Rights accepted the complaints made by the refugees of Patras. The Italian government will be brought to court for violating the fundamental rights of 35 Afghan and Sudanese asylum seekers, including many minors, who were repulsed without any formal procedure at the Adriatic ports and were deprived of the opportunity to apply for political asylum in the two countries. The appeals were submitted by lawyers Luca Alessandra and Ballerini Mandro, in collaboration with Fulvio Vassallo Paleologo, who collected the proxies after a visit to Patras in Greece with a delegation of the Committee Tuttiidirittiumanipertutti, a network of associations established in Venice about the issue of refusals of potential refugees in Greece. Once rejected, the refugees are being arbitrarily detained for several days in a container at the police station in the port of Patras. They are often released and returned to the slums where thousands of refugees live on the outskirts of the city, trying every night to climb in secret on the trucks about to embark for Italy. In addition to Italy, the European Court has decided to charge the Greek government in order to ascertain possible violations of fundamental rights of the applicants, although the lawyers had made no such request. Since years, the ports of Venice, Ancona, Bari and Brindisi have become one of the main points of entry for asylum seekers in Italy. During 2008, the readmissions to Greece reached 5644, according to data from the Ministry of Interior. Most of them come from Afghanistan and Iraq. Many are minors. At the ports, some groups are working alongside the police to guarantee the right of asylum. But those same groups are often not even informed about the presence of refugees on board ships. The data leave no space of doubt. During 2008, in Venice, the Italian Council for Refugees (Cir) states that it has assisted 138 people, including 42 Afghans and 64 Iraqis. During the same period the Port Police states that it has intercepted and returned to Greece 1610 people. Which means that 92% of those who have illegally shipped to the capital of Veneto were returned without any access to asylum procedures. The same happens in other ports, although to a lesser extent. Ancona in a year were turned down 2106 people, compared with 259 assisted between November and December 2008 from the Cir. In Brindisi, the ratio is 184 against 730. While in Bari, also in 2008, 1198 were rejected. Not even all applicants assisted by associations decide to apply for asylum in Italy. The reason is simple. Their goal is to go to England or northern Europe, and if they leave fingerprints on the Italian border, they will be forced to reside in Italy. Among those repulsed are many Afghans. One of them was Zaher, the thirteen-year-old who died last December 13 in Venice, crushed under the truck which was bound to enter Italy. Upon dismembering from the vessel, he did not reach the police, because he was afraid of being rejected in Greece. Rejection apllies to children as well. As it apllied to Juma K., rejected three times from Venice and Bari, at the age of sixteen. the United Nations High Commissioner for Refugees has many times expressed its concerns against readmissions of asylum seekers to Greece. In a note dated 13 April 2008 UNHCR asked the EU Members to abbey the EU Dublin II Regulation about the repulsion of Refugees to Greece. And the UN High Commissioner Guterres has spoken of the border with the Adriatic Minister Maroni, in their recent meeting. 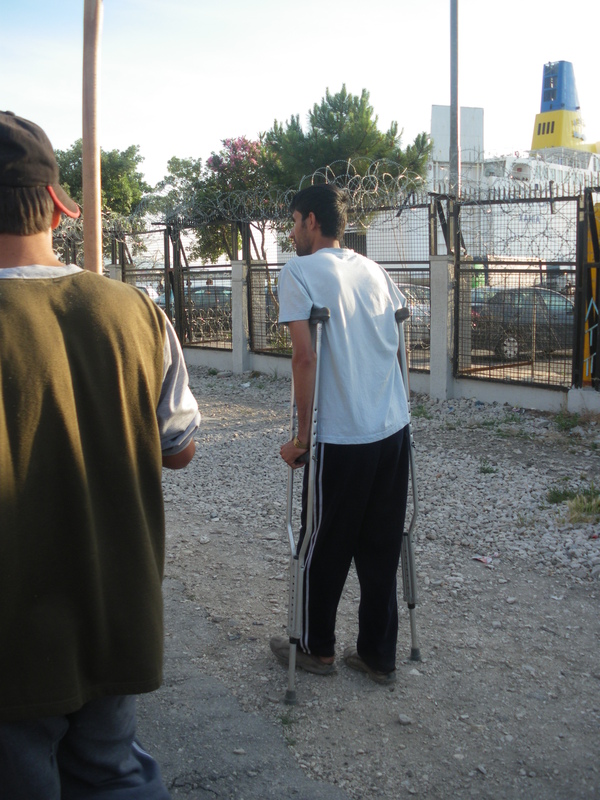 On 24 June 2008 the Tar Puglia organization blocked the readmission to Greece of an Afghan refugee on the basis of this position of the UNHCR. A decision that the Norwegian government had independently taken in February 2008, blocking thus the readmission or refugees from Norway to Greece. The European Parliament adopted a resolution on Iraq on 15 February 2007 which also made references against Greece, albeit in an indirect way, without ever mentioning the country,.